Asit Goel, senior vice president of NXP Semiconductors, leans forward to emphasise his point about the potential of applications that know all about us and our immediate environments. I meet Goel for lunch in a central London restaurant on a rainy November day. Urbane and funny, he has lived all around the world, swapping countries on an annual basis in a previous role at management consulting group Bain. He says he misses the London showers he once detested now he lives in sunny California. Goel is good company and has strong views over where IoT technology will help take us. IoT is the latest technology phenomenon to have its moment in the sun, of course. Pundits obsess over it, journalists cover every twist and turn in fortunes and ponder the implications for data privacy and individual freedoms. Goel is at the very heart of the action though. NXP is a leading maker of microprocessors, communications chips and what he calls “jellybeans”: the other circuitry needed to give systems digital instrumentation. 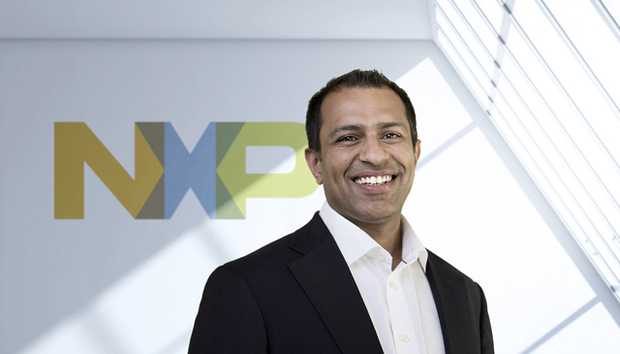 NXP had $5.6bn in 2014 revenues and a merger agreement with Freescale will create a $40bn powerhouse. NXP designs and manufactures the tiny parts that power connected cars, lighting, travel smartcards, building access systems, industrial systems, gaming consoles and many more applications. And we’re only just beginning to explore what happens when we connect machines to machines on a scale that can be difficult to even imagine. But certainly the flurry of activity and deal making among chipmakers points to the size of the opportunity: just look at Avago and Broadcom, Cypress and Spansion, Qualcomm and CSR, or Skyworks agreeing to buy PMC-Sierra. As a veteran of parts that cost between cents and a few dollars a pop, NXP is in a strong position though. “When you look at what the IoT devices need, they’ve got to have some sort of processing, they need connectivity and a lot of security, and our entire portfolio is built around these things,” Goel says. Goel is particularly excited about wearables, pointing me to research that suggests three-quarters of our bodies could end up being connected by various forms of technology. Thus clothed we can better see what’s in front of us and what’s around the corner, understand our bodies, risks and opportunities. Already we see watches, wristbands, heart monitors, eyewear and more and Goel expects a mixture of approaches in different markets. And those different approaches will all require different features, connectivity and power characteristics hence the wide variety of IoT protocols and proposed standards from Zigbee, Thread, Bluetooth variants, WiFi, Z-Wave, WeMo and many more. Goel is sanguine about what might seem a chaotic environment, pointing to the development of a huge number of new products and categories and highlighting Bragi’s much-hyped Dash wireless earphone buds with activity tracking. Going back to Goel’s point about 75% of the body being covered in wearable technology, I suggest that subcutaneous applications could be more effective if we’re not to spend half the day getting dressed up to take advantage of technology. Goel sees a role for digital patches that adhere to the skin but draws the line at ingestible/edible sensors, currently being touted by some pharma companies to better understand the human body, unless they were needed for urgent health treatment. In terms of competition, he sees a world of change. What would he do if he ran a big chip company like Intel, I ask, used to making fat profits from PC processors but now challenged by companies like ARM everywhere from products that fit in the pocket to super servers. He contends that security know-how will be a strong suit for NXP. “Everyone talks about end-to-end security but most companies don’t know how to do it,” he says, and physical attacks and drive-by attacks are clear and present dangers in a world of digital security defences. He also believes that “most people don’t know how much security they need” and calls for a consumer-friendly guide to risks becoming part of consumer packaging. And with that Goel is off to catch another flight to another country.